>>>This is a multi-unit set and the shipping cost will be adjusted to that of 2 DVDs. To learn more about the shipping cost, please visit our Help Page and look for shipping information. Two Korean films invited to the Cannes Film Festival last May are opening one after another across France, gathering attention from many. The films are "Secret Sunshine", directed by Korea's one of the most representative directors LEE Chang-dong, and "Breath" by another famous director, KIM Ki-duk. 15 Korean films are being showcased this November at the 2nd annual London Korean Film Festival, screening at the Barbican in London's financial district. Opening the weeklong festival, which runs the 2nd to the 8th, is KIM Ki-duk's 2007 Cannes competition entry, "Breath". The film quickly sold-out as has the festival's curtain-closer. One of Taiwan's best actors, Chang Chen (Eros), teams up with maverick Korean director Kim Ki Duk (Time) for Breath, a bittersweet love story between a death row inmate and a woman who feels betrayed by her husband's infidelity..
After finding her husband�s infidelity, YEON absent-mindedly heads for the prison where condemned criminal JIN is confined. Although she doesn�t know him, repeated news of his suicide attempts on TV had subconsciously grown in her mind. Their first meeting is as awkward as it can get. YEON treats JIN like an old friend whereas JIN doesn�t open up so easily. To JIN�s surprise, YEON comes back for the interview again and again, with the decorated interview room like sping, summer and fall. YEON sings him seasonal tunes in dresses of that season. JIN gradually accepts YEON�s efforts and opens up to her. One day, her husband witnesses the intimacy between YEON and JIN and tries to separate them. They can�t see each other again while the limited time for JIN is ticking away. But the two are already attached to each other more than her husband assumed -- more than life and death. 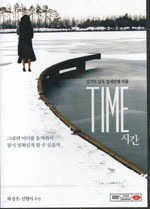 Director Kim Ki-deok�s new work �Time� has been selected as the opening movie of the 41st Karlovy Vary International Film Festival held in Czechoslovakia. The organizer of the film festival said that it was honored to screen Kim Ki-deok�s new film for the first time in the world. The movie portrays lovers who make an extreme decision to overcome a relationship crisis and to rekindle their love. Actors Seong Hyun-ah and Ha Jeong-woo play the female and male leads of the film. Two years after getting together, Se-hee feels that Ji-woo�s love for her has been cooling. Gripped by anxiety, Se-hee makes the extreme decision to have plastic surgery and become a different-looking woman. Six months later, Se-hee approaches Ji-woo to start a new love relationship pretending that she is a different woman. Against her expectations, Ji-woo cannot forget his "ex"-lover and Se-hee is caught in a dilemma. A searing examination of modern culture's obsession with youthful beauty and unattainable physical perfection. Attractive Seh-hee is having problems with her boyfriend, Ji-woo. After two years, their love has entered a period of weariness. Though faithful to his fiancee, Ji-woo eyes other women and, in bed, only seems to get excited at the thought of making love to other partners. Seh-hee can't cope with the crippling jealousy tainting her life and decides to dramatically change her looks - to become a new woman, with whom her boyfriend can fall in love all over again.